series but there is still a lot of hockey to be played. The series got underway at Honeywood arena on Saturday, March 17, with a huge number of supporters in the stands. The Wild got the opening goal in Saturday’s game – the only goal of the first period. 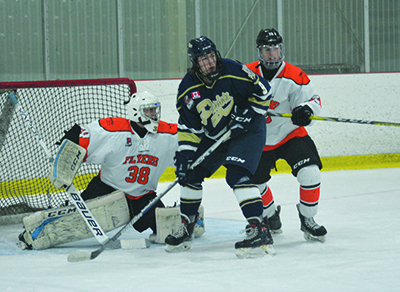 It was a tie game when Honeywood’s Stephen Falls scored with 8:16 on the clock in the second period. Fourteen seconds later the Wild scored to take a 2-1 lead. It took just 14 more seconds for the Honeywood team to get back in the game when Kyle Johnson hit the back of the Wainfleet net to make it a 2-2 game. Back on the ice for the third period, both teams stepped it up a notch to see who could come out on top. The Wild at a minute into the third, but Honeywood again tied it up on a goal from Austen Hamilton. Hamilton got his second of the game with 3:27 left on the clock, but again it was a short lived lead when the Wild scored the tie goal with just ten seconds remaining. A regulation overtime period saw neither team able to score and they had to settle for a 4-4 tie and each team getting a single point to start the series. Game two of the series took place in Wainfleet the following day (Sun. Mar. 18) and ended with a 2-1 loss for the Honeywood team. The series will resume this weekend with game three taking place a the North Dufferin Community Centre on Saturday, March 24, at 5:00 p.m.
Game four will be in Wainfleet the following day, Sunday, March, 25, with a 2:00 p.m. start.